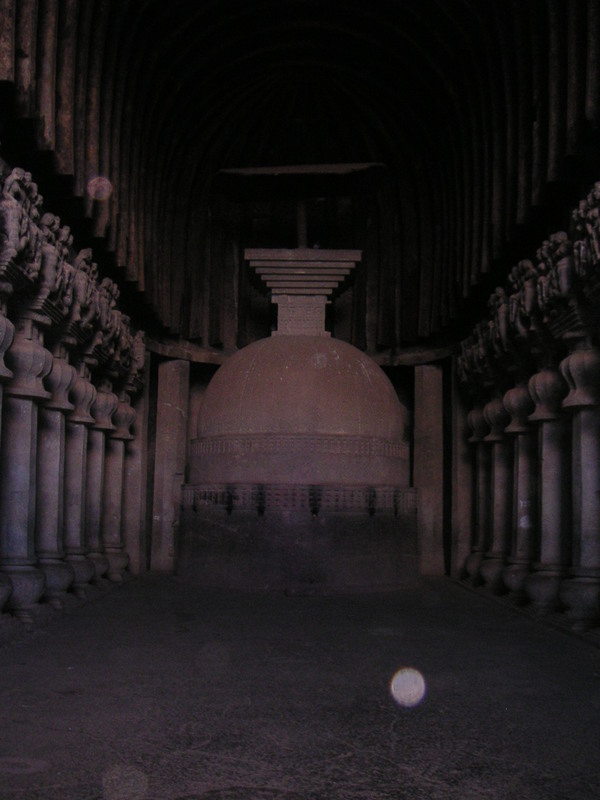 We had the day off on Monday, so decided to take a day trip to Lonavala, site of some hill stations and the ancient Buddhist Karla Caves. Located about two hours outside of the city, Lonavala is for city folk one of the favorite weekend R&R points. So a trip on Monday was ideal; it meant less traffic (going, at least) and fewer tourists. Unlike Matheran, another nearby hill station, Lonavala is located off of the Mumbai-Pune expressway, a relatively nice highway with a few rest stops along the way. We stopped about halfway there to refuel and have a little breakfast. I had a butter dosa (a rice pancake, no filling, served in conical form) and Anthony had wada pav, which is basically a spicy (cumin, fenugreek, chilis) potato patty served on a roll. An Indian burger, if you will. The three of us, our driver included, also had little cups of chai before we were on our way. After some random factories, the urban landscape really gives way to the countryside. As we zoomed up the highway, we saw a family of monkeys hanging out on the side of the road. On the other side, remnants of the monsoon were draining down the rock faces. Once we got off at the Lonavala exit, the road declined into a series of unnavigable potholes. At least a dozen cows greeted us. There were also some shoddy-looking vendor stands staggered between guesthouses and hotels. There are a few starred hotels on the way, though I noticed that a sign in the parking lot in front of one nice one said, “Management can not be responsible for stolen cars.” Uh?why can’t they? Further on, we stopped by a man-made lake to take a look around. There was a footbridge from which we could get better views of the Deccan plateau and the lake. Of course, once we started to cross over, we saw whole families doing laundry and bathing. Kids were frolicking, as much as young kids in such dire conditions can. A few feet from there, a couple more cows were drinking from the same water. Such a rural Indian scene. The Tata Corporation, a company that seems to own a large share of India, owned the dam that had created the lake, and of course there was a sign saying that all of the things that the families above were doing were “prohibited.” How can you enforce laws against people who can’t even read them, eh? Anyhow, the bridge and lake were interesting, but nothing to write home about (though I just did). We had our driver pick us up on the other side and we proceeded on to check out a dam. Bad move. In order to get a look at the water rushing over the dam, you had to go to visit this run-down satellite village and walk through a knee-high pool of fetid water. We quickly decided to take a pass. We’ve seen dams before. On to the town of Lonavala! The Maharashtran state elections are on Wednesday, so we had to contend with roving bands of trucks outfitted with loudspeakers and campaign posters. From what we gathered, Lonavala seemed to be Shiv Sena (Hindu Nationalist) country. My favorite recent campaign peace offering from Bal Thackeray, the local, sunglass-wearing, scotch-drinking, Shiv Sena uebermensch, was that he and his party wanted to reach out to “pre-1995 north Indians and Muslims.” So, basically, anyone from those groups who came to Mumbai/Maharashtra after 1995 can go to hell. Gotta love the rhetoric. Lonavala is the “typical” rural tourist town. It’s got some schlocky t-shirt stores, some travel bureaus, and tons and tons of chikki marts. The saltwater taffy of these parts, chikki is an edible substance that’s sort of like peanut brittle, fudge, and Butterfingers, depending on the ingredients. Peanut and cashew chikki seem to be the most popular. Later, on the way out of town we ended up buying a couple variety packs. Finally, we got to enter the caves, and they were spectacular. The first room was cathedral-like with high ceilings, rows of columns with elaborately carved capitals, and a dark, solemn silence. 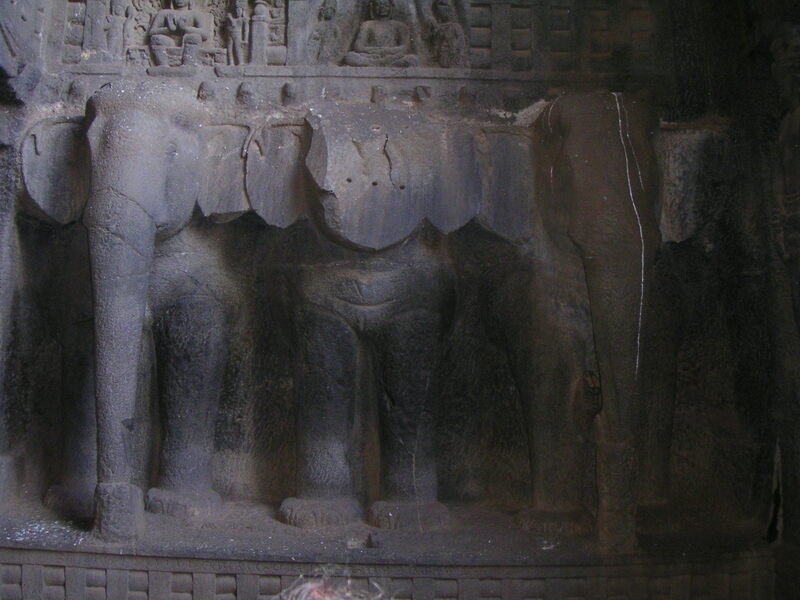 At the fore was an altar and in niches were carvings of Buddha, animals, amorous couples, and, interestingly, a wheel, not unlike the spinning wheel that graces the Indian flag. 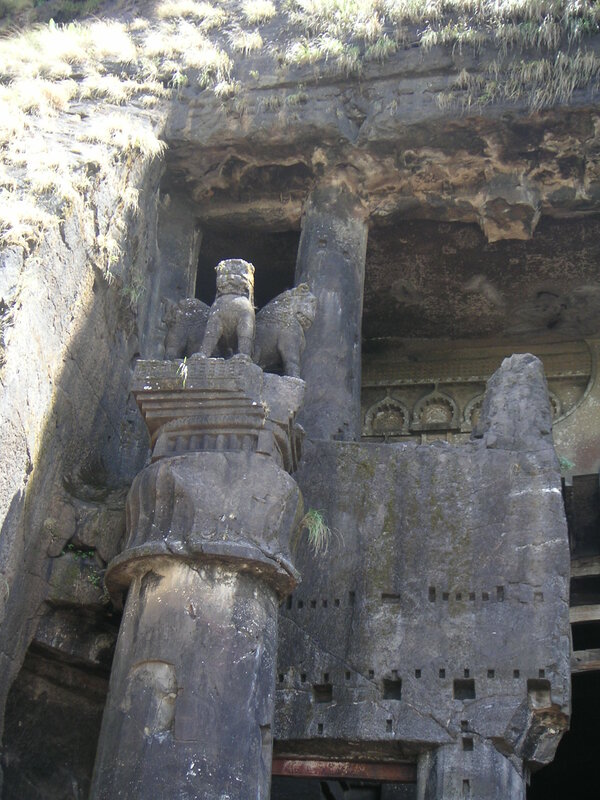 The guide continued to point out other things that we hadn’t noticed upon entering, including a towering lion column (another flag note: the lions look the same as those on the Sri Lankan flag) and huge, stone elephants, which had mostly lost their trunks from wear and tear. The main cave was the most impressive, but we walked along to a couple others that had been used as sleeping/praying rooms. If you’ve ever seen some of the spartan living quarters in pre-Renaissance, European monasteries, then you have some idea of what these conditions were like. The monks slept and prayed on stone. I don’t know about you, but I think that sort of situation would have me concentrating on a pillow or a bale of hay, not on piety. I’d never be able to handle it. 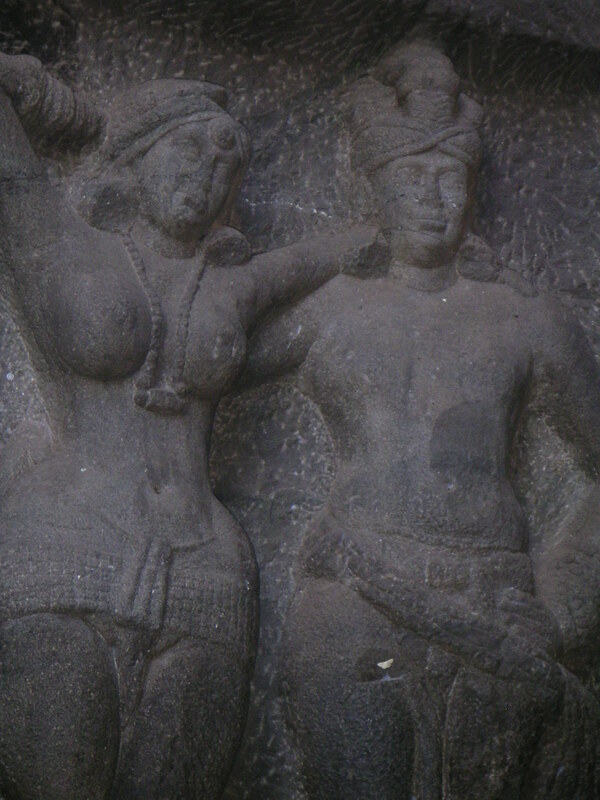 It was hot (even at those heights), and the Karla Caves were not as extensive as we previously thought. Apparently, there were other caves in the neighborhood (about 2 kilometers away), but we would have to walk and pay yet another entry fee to see them. (Another bogus thing that I’ll attribute to the Shiv.) So, in total, we spent about two to three hours in Lonavala, and about six hours on the road. Was it worth it? I’m not so sure. Maybe next time we’ll take the train. I didn’t tell you about the traffic on the way back, did I? As Monday was the last day of campaigning before the state elections on Wednesday (campaigning must halt two days prior to going to the polls), we were greeted with unbearable traffic on our way back into Mumbai. Sonia Gandhi was in town to campaign for the Congress party candidates, and I’m sure it was her presence that caused us to sit in traffic for hours. But I won’t hold it against her. For one, she’s Italian. And, the hope is that Congress will be more concerned with building adequate housing and infrastructure instead of Hindu temples in front of Buddhist shrines. Wish I could vote in India, too. I must mention at the outset that I’m thoroughly enjoying your blog. I “accidentally” came across it late last week. And its managed to hold my attention so far :). I’ve managed to catch up on my reading and am now looking forward to the next post from you. Oh yeah … forgot to introduce myself … I’m Vikas, grew up in Bombay (allright Mumbai if u insist ;)) and have been living here in Canada for the last few years. I have fond memories of the city and although they’re “very” outdated (haven’t lived there for over a decade now), i always enjoy my time there when i’m visiting. Its interesting to get a different perspective on life in the city. Most ppl I know, either hate it or love it. There’s rarely a middle ground. Until then take care and keep blogging.